, an eminent ecclesiastical writer, and a cardinal of the Roman church, was born at Sora, an episcopal city in the kingdom of Naples, October the 30th, | 1538, of Camillo Baronio and Porcia Phebonia, who educated him with great care. He went through his first studies at Veroli, and afterwards applied himself to divinity and civil law at Naples. But the troubles of that kingdom obliged his father to remove him in 1557 to Rome, where he finished his studies in the law under Cesar Costa, afterwards archbishop of Capua, and put himself under the discipline of St. Philip de Neri, founder of the congregation of the oratory, who employed him in the familiar instructions which his clerks gave to the children. After he was ordained priest, St. Philip de Neri sent him, with some of his disciples, in 1564, to establish his congregation in the church of St. John the Baptist. He continued there till 1576, when he was sent to 8,t. Mary in Vallicella, and in both houses he was much admired for his pious zeal and charity. St. Philip de Neri having, in 1593, laid down the office of superior of the congregation of the oratory, thought he could not appoint a more worthy successor than Baronius, and pope Clement VIII. who knew his merit, in compliance with the desires of the founder and his congregation, approved the choice, and some time after made him his confessor. The esteem which that pope had for him, increased as he had an opportunity of growing more intimately acquainted with him, and induced him to appoint our author apostolical prothonotary in 1595, and to advance him to the dignity of cardinal, June 5th, 1596, to which he afterwards added the post of library-keeper to the see of Rome. Upon the death of Clement VIII. m 1605, Baronius had a great prospect of being chosen pope, one and thirty voices declaring for him; but the Spaniards strongly opposed his election on account of his treatise, “Of the Monarchy of Sicily,” in which he argued against the claim of Spain to Sicily. His intense application to his studies weakened his constitution in such a manner, that towards the end of his life he could not digest any kind of food. He died June the 30th, 1607, aged sixtyeight years and eight months, and was interred in the church of St. Mary in Vallicella, in the same tomb where his intimate friend cardinal Francesco Maria Taurusio was buried the year following. 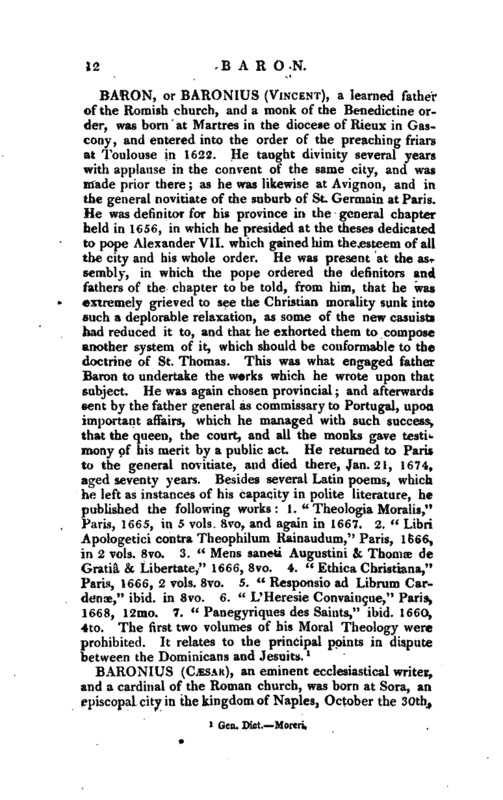 Dupin observes, that “an high regard ought to be paid to the memory of Baronius, who was a man of sincere religion, probity, learning, and extensive reading, and laboured with success for the service of the church, and the clearing up of ecclesiastical | antiquity. But it were to be wished that he had been exempt from the prejudices which his education and country inspired him with*” In a book of lather Parsons, printed in 1607, and entitled “I)e sacris alienis non adeundis qusestiones du; ad usum praximque Angliae breviter explicate,” is published the judgment of Baronius, together with that of cardinal Bcllarmin and others, declaring that it was absolutely unlawful for the Roman Catholics to be present at the religious worship of the Protestants in England. 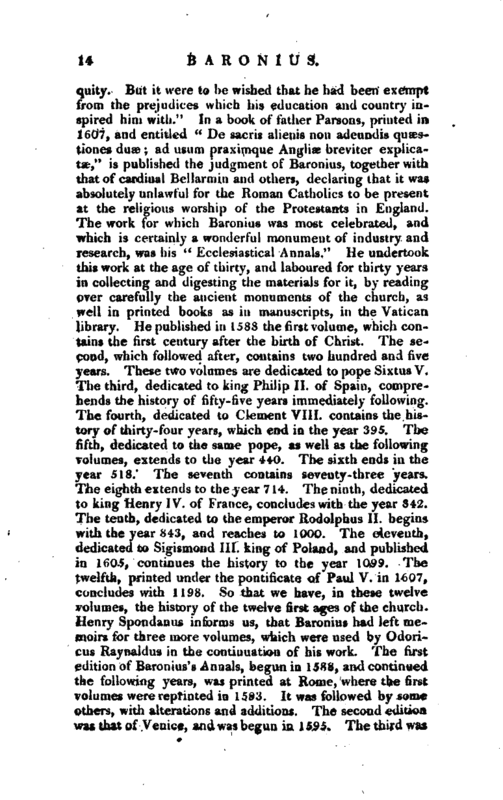 The work for which Baronius was most celebrated, and which is certainly a wonderful monument of industry and research, was his “Ecclesiastical Annals.” He undertook this work at the age of thirty, and laboured for thirty years in collecting and digesting the materials for it, by reading over carefully the ancient monuments of the church, as well in printed books as in manuscripts, in the Vatican library. He published in 1588 the first volume, which contains the first century after the birth of Christ. The second, which followed after, contains two hundred and five years. These two volumes are dedicated to pope Sixtus V. The third, dedicated to king Philip 11. of Spain, comprehends the history of fifty-five years immediately following. The fourth, dedicated to Clement VIII. contains the history of thirty-four years, which end in the year 395. The fifth, dedicated to the same pope, as well as the following volumes, extends to the year 440. The sixth ends in the year 518. The seventh contains seventy-three years. The eighth extends to the year 714. The ninth, dedicated to king Henry IV. of France, concludes with the year 842. The tenth, dedicated to the emperor Rodolphus II. begins with the year 843, and reaches to 1000. The eleventh, dedicated to Sigismond III. king of Poland, and published in 1605, continues the history to the year 1099. 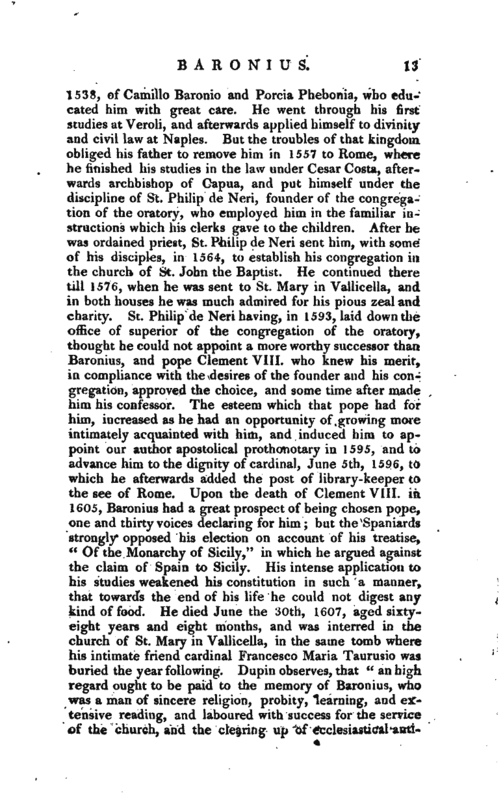 The twelfth, printed under the pontificate of Paul V. in 1607, concludes with 1198. So that we have, in these twelve volumes, the history of the twelve first ages of the church. 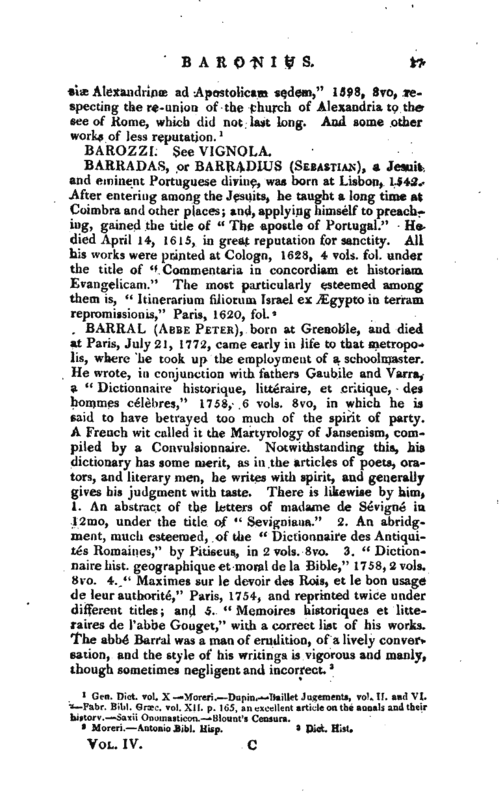 Henry Spoudunns informs us, that Baronius had left memoirs for three more volumes, which were used by Odoricus Kaynaldus in the continuation of his work. 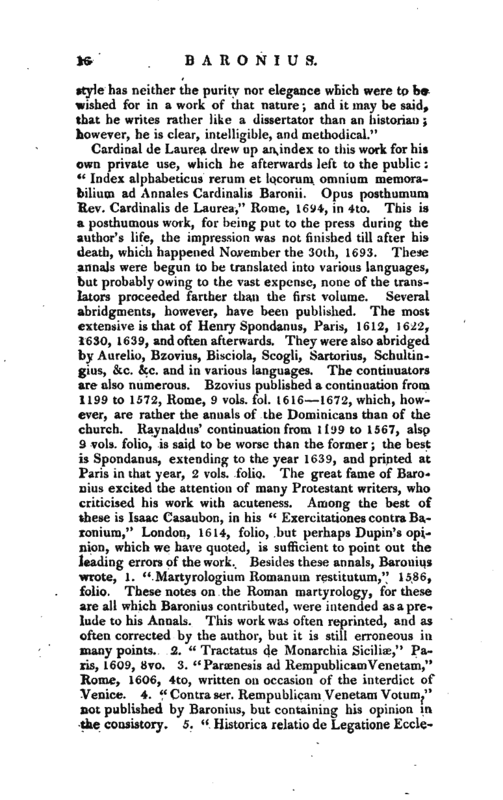 The first edition of Baronius’ s Annals, begun in 158S, and continued the following years, was printed at Rome, where the first volumes were reprinted in 1593. It was followed by some others, with alterations and additions. The second edition was that of Venice, and was begun in 1595. The third was | printed at Cologne in 1596, and the foil owing years. The fourth at Antwerp in 1597, &c. The fifth at Mentz in 1601, The sixth at Cologne in 1609. There were several other editions published afterwards, at Amsterdam in 1610, at Cologne in 1624, at Antwerp in 1675, at Venice in 1705, and at Lucca in 1738—1759, by far the best. 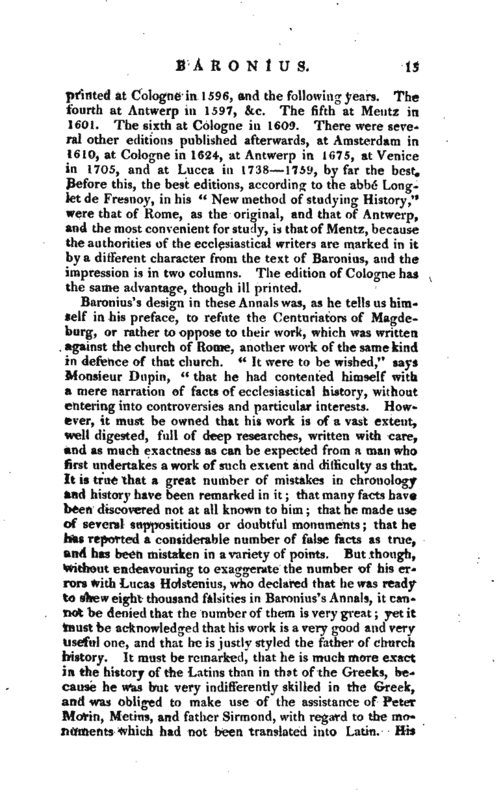 Before this, the best editions, according to the abbe Longlet de Fresnoy, in his “New method of studying History,” were that of Home, as the original, and that of Antwerp, and the most convenient for study, is that of Mentz, because the authorities of the ecclesiastical writers are marked in it by a different character from the text of Baronius, and the impression is in two columns. The edition of Cologne has the same advantage, though ill printed. Gen. Dict. vol. X—Moreri.—Dupin.—Baillet Judgements, vol. II. and VI. —Fabr. Bibl. Grace, vol. XII. p. 165, an excellent article on the annuals and their history.—Saxii Onomasticon.—Blount’s Censura.